kidslooklikekats: Pick Of The Week: "Dots And Loops" (1997) By Stereolab. 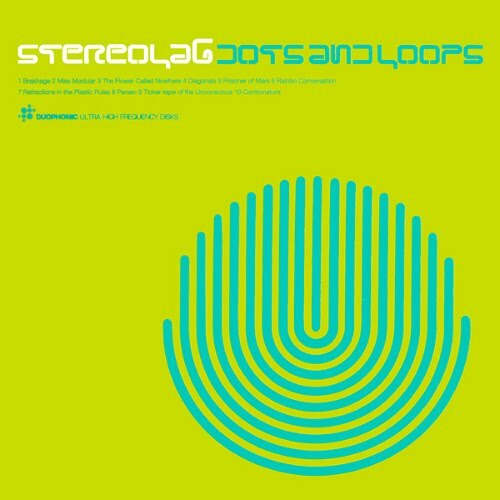 Pick Of The Week: "Dots And Loops" (1997) By Stereolab. Dots and Loops may be one of the most instrumentally brilliant albums I've ever heard. Imagine every pleasant sound you've ever heard, as well as some bubbly experimentation for good measure and a captivating brass section that compliments the music so much you can't possibly imagine hearing it without, and you've arrived at Stereolab's Dots and Loops. The album introduces a more lounge-influenced Stereolab, replacing the favored guitar-driven song structures with more Moogy, vibey constructions of flowery, electro-pop bliss. "Brakhage" is an ode to experimental filmmaker Stan Brakhage, and fearures Douglas McCombs of Tortoise and Brokeback. "Miss Modular" contains one of the most unique and interesting Moog lines of any Stereolab song (it sounds like a corny toy organ played at each chord change and randomly throughout), and a supporting acoustic and synthesizer medley. "The Flower Called Nowhere" is an absolutely gorgeous tune, and swirls together plenty of synths and beautiful vocal harmonies between Sadier and Hansen (which is really what makes Stereolab so great; the two most amazing women in modern pop/rock music, R.I.P. Mary). "Diagonals" has an inventive, playful opening, and soon becomes one of the most charming songs on the album. "Prisoner of Mars" is something of a musical trap door, and once you've fallen into it, you're in it till you hit bottom; luckily, the bottom is "Rainbo Conversation", a moving little love song with a double-dose of Parisian stylistic sentimentality and little of the krautrock sound the Groop has become famous for incorporating. Mary Hansen adds an amazing amount of charm to the track with her pretty harmonies (as usual, and also especially). "Refractions in the Plastic Pulse" sees a minimal layer of instrumentation featuring one acoustic, one vibe, and some subtle Moog filler, and of course Sadier and Hansen's masterful melodies. The track winds on and on, through three separate movements of electronic experimentation (aided by Jan St. Werner of Mouse On Mars) and an eventual (loose) return to the song's originating melody line (ce qui est, n'est pas clos, ce qui est ouvert, est à ítre - what is isn't closed, what is open is to be). "Parsec" is a trancey piece of IDM with an intensely brilliant collection of vocal melodies, harmonies and scats. "Ticker-Tape of the Unconscious" will become your favorite track off the album, and it lodges itself inside your head for days, weeks, after first listen. "Contronatura" is our jazzy, krauty little wrap-up track, and ensures that quaint little (pretentious) smile remains on your lips long after the music ceases; Dots and Loops is quite literally the perfect album for a sunny, lazy day, and a rival to any of those brilliant records you hold in such high regards. Pleasant surprises will amass.